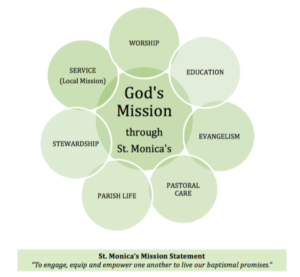 We assist the Rector with the spiritual care of all parishioners of St. Monica’s. We support the Pastoral Ministry of the rector by coordinating with our clergy, the many ministries of the Pastoral Care Team (Lay Eucharistic Visitors, Stephen Ministers, Parish Nurses, and Prayer List/Pray Chain Ministers). We make home visits, pastoral care contacts, and we communicate to the Rector specific pastoral needs that require his/her direct intervention/support. We use approved methods of communication for collaboration and mutual support. Parishioners called to the healing ministry participate in the Wednesday noon service as available, and at Saturday/Sunday services on the weekend of the second Sunday of each month. They are also available to pray with parishioners when needed. Training is required. Stephen Ministry is a program that equips lay people to provide confidential, one-to-one Christian care to members of St. Monica’s and individuals in the community who are experiencing difficulties in their lives. Stephen Ministers listen, care, pray, support and encourage the person in need. They receive 50 hours of training, and will “be there” for their care receiver. Loss of a loved one, hospitalization, divorce or separation, job crises, a difficult medical diagnosis, a move, and loneliness are some of the life challenges that a Stephen Minister might help a care receiver deal with. These specially trained and licensed lay people bring communion to those who are not able to come to church for services. If you or someone you know is unable to attend church and would like to receive home communion, please contact Don McCleary (Lay Eucharistic Team Leader) at 239-390-2258, or Linda Flores or Fr. Eric at 239-591-4550 to arrange for communion in your home, extended care facility, or hospital. If you, or someone you know needs prayers – any kind of prayer – you email our prayer chain coordinator, who sends your request to everyone on the list. When the pray-ers receive the request, they stop what they are doing and say a prayer. Most prayer chain participants also add the request to their daily prayers. The prayer list that is published in the Sunday announcement insert is maintained by the Pastoral Care team. To add a name, you can email info@stmonicasnaples.org or call the office (591-4550), with the name and other information. You can also indicate if you would like a card sent from St. Monica’s. These names are mentioned in the Prayers of the People the week they are added, and they remain on the printed list for 4 weeks unless you request a longer time. © 2019 St. Monica's Episcopal Church.